Image | This entry was posted in The Scottie Chronicles and tagged dogs, Scotties, The Scottie Chronicles. Bookmark the permalink. You have “See no Evil”. Where are the other 2 monkeys? 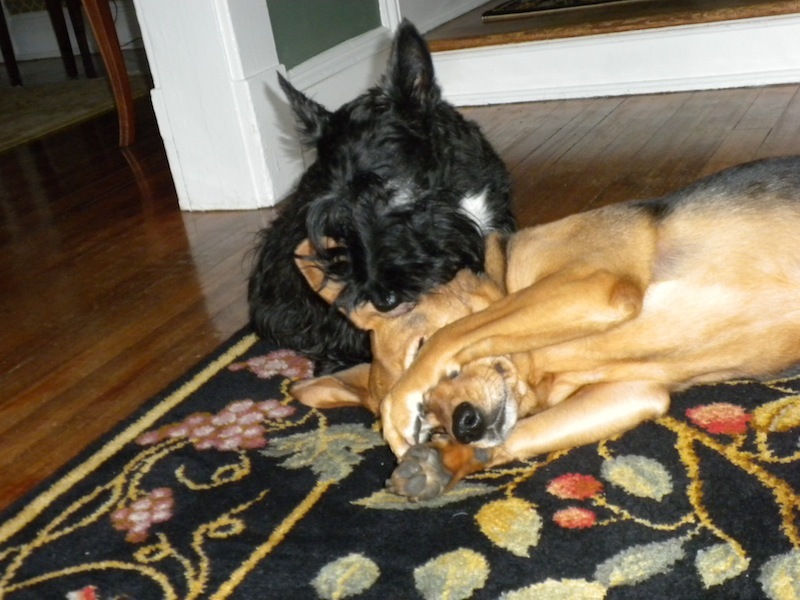 Not sure, Stu, if you’re trying to wake up your friend or if he’s playing ‘I Don’t See You, You Don’t See Me.’ Silent Sundays are good for play dates with a friend! Enjoy! You are such a good friend, cleaning out your friend’s ears. My scottie Bonnie used to get the bugs out of my hair. She was such a helper. Has Sniglet gone all shy? We don’t think that Sniglet thinks it’s a good plan, Stuart! Oh a good ear clean! That is a favorite at our house too!